Landscape, as a completely independent genre, was formed relatively recently and for several hundred years has undergone many transformations and rethinking. In the exhibition, the viewer is invited to get acquainted with the diversity of attitudes, with individual and original points of view of artists. Many, while remaining within the framework of realistic art, create their imaginative vision of nature, their attitude towards it, and express this in the plots, in the chosen motifs. Others go beyond realism, preferring formal solutions. Landscape (fr. Paysage, from pays - country, terrain) - ¬ image of pristine or transformed by man of nature, the genre of fine art. Before the landscape declared itself as a separate genre in world art, he acted as “scenery” for genre works, for portraits. In the 17th century, artists more and more often begin not only to appeal to the motives of nature, but often give them greater significance, with the result that very soon the landscape becomes a self-sufficient and full-fledged hero of the painting. But artists look at the world with a special look, transforming the environment, endowing it with idealized features, as a result of which nature on their canvases acquires a pathetic sound. The nineteenth century makes its own adjustments to the realities of artistic life - artists take to the streets and begin to write nature directly from nature, they refuse theatricality and idealization, speaking out for the truth of life in the visual arts. In their canvases as the main character is not only the motive, but also a specific state of nature. It should be noted that in many respects the reason for such significant changes is the progress that touched the sphere of art, and this was due to the appearance of colors in the tubes, which made life much easier for artists and allowed them to leave their workshops and go to the open air without any particular obstacles. But the evolution of the landscape does not stop there, and the artists, entering the 20th century, do not stop their search for new means of expression. Relying on the experience of their predecessors, rethinking their work, they are looking for and find themselves in the landscape, but in new picturesque directions, through the new prism of world perception. Some of them remain in the previous boundaries of realistic painting, others become closely in these realities, and they go beyond the world surrounding them, taking natural impressions as a basis and turning them into vivid, sometimes phantasmagoric, images. This exhibition introduces the works of Russian artists of the 20-21 centuries. For each of the authors presented, the landscape is primarily an image of the Motherland, native land, where everyone brings their own mood to this image: somewhere it is the silence and tranquility of a remote wilderness, as in the paintings of Efrem Zverkov and Vitold Byalynitsky-Birul, somewhere joy living at the sight of loved ones close to the heart, like, for example, Joseph Pavlischak or Kim Britov, and somewhere a collective image, like Vladimir Arepiev, Yuri Shishkov and Olga Kuzminova. Victor Glukhov, Viktor Ivanov, Sergey Gerasimov express their bright warm and original attitude towards the Motherland in their canvases. Speaking about the directions in art, it is worth noting that the works of Joseph Pavlischak, Evgeny Shcherbakov, Nikolay Romadin carry the features of impressionistic painting. Emotional and expressive works of such authors as Irina Starzhenetskaya, Vladimir Davydov, Vazha Okitashvili. 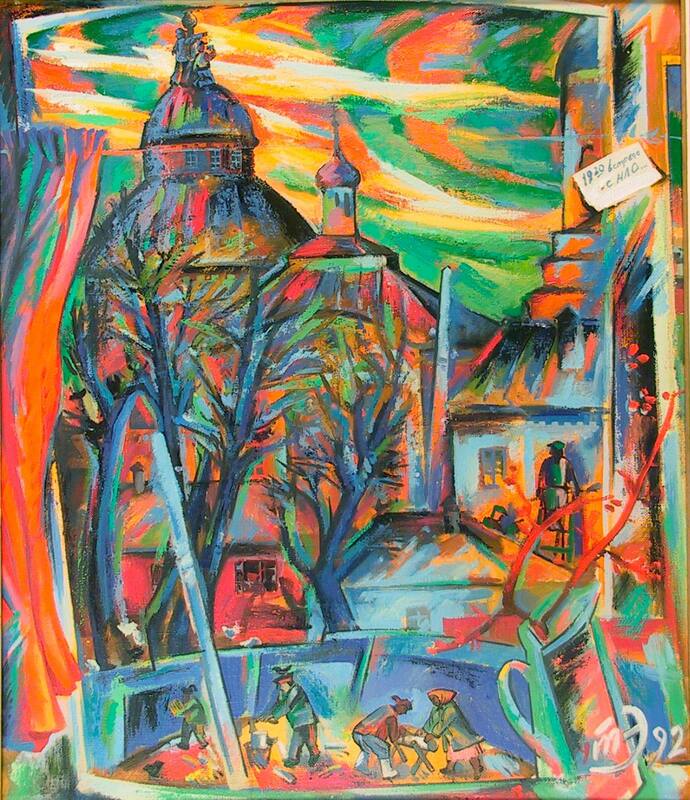 Many of the paintings in their bright color and compositional decisions refer us to the traditions of the Russian avant-garde of the early 20th century. The exposition offers not only to contemplate, but also to compare the presented works among themselves. But comparing is not in the key “better or worse”, but in how each artist is individual, unique and recognizable, how authors of different generations differ from different points of view on the landscape and on art in general. At the address: st. Lenin, 103, 2nd floor every day from 10.00 to 18.00, Saturday - from 11.00 to 19.00, the day off is Monday.